This was my fourth time running the Trail half marathon but I've never run the 5 mile race. Poto trails are about 70 miles from me so it's hard to go back there twice in a weekend but I had a great time. I always love running the trail half and the five mile was a nice course as well and quite hilly. Actually both races are pretty hilly but loads of fun! This year the race had something called No Wimps Jr. Challenge which is running the half on Saturday and the 5 mile on Sunday. If you have not run these before, they are worth checking out. 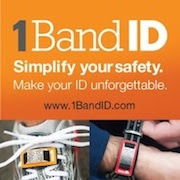 Registration is very easy with Running Fit as they always have their own websites for each race and a place to register. 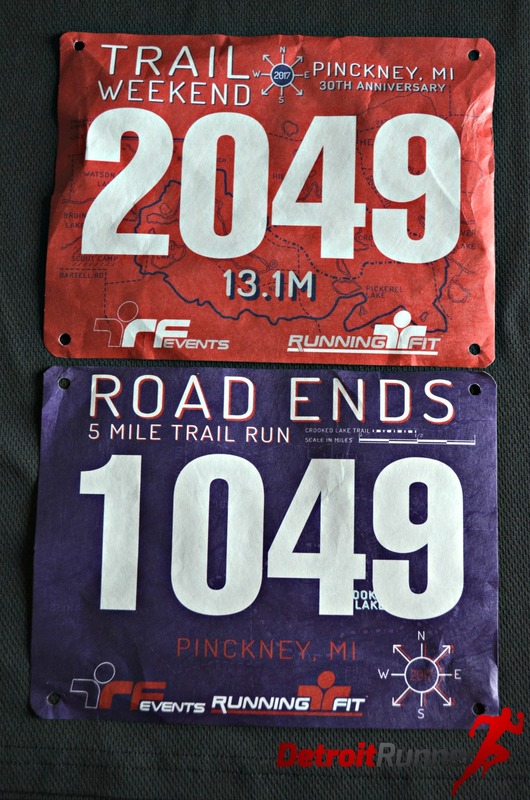 This year I was lucky enough to get two free bibs from some runners that could not run the races and just didn't want their bib to go to waste. I transferred my name to them and ran both races. It was just an email getting permission from the runners and a call to Running Fit to have them transfer the races to me. Very easy. 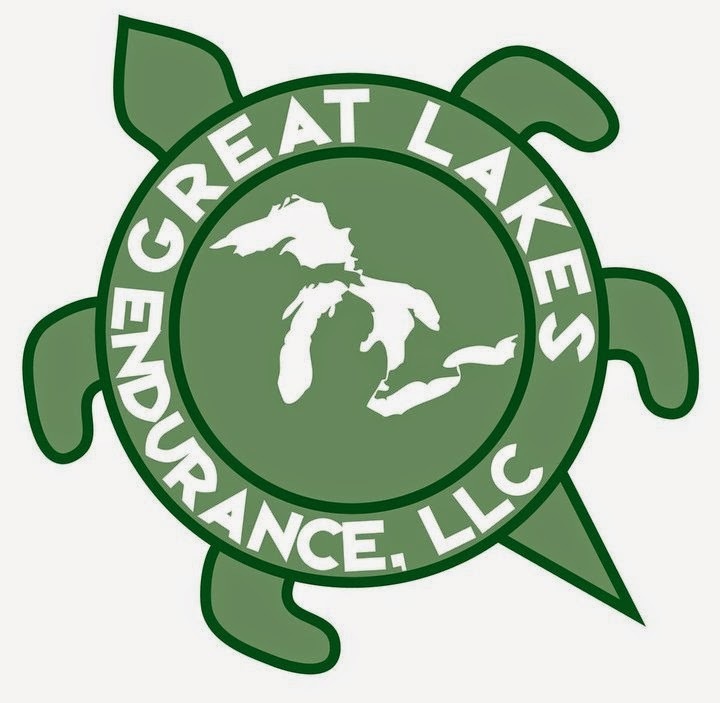 When I got to packet pickup on Saturday, they had a place for No Wimps people to pick up their bibs and shirts by last name and took minutes to get. We did have to sign a release form prior to getting our packet too. I don't remember doing this for their past events? Usually you just click a button online but this time we filled out a form with emergency information as well. The start area is always well organized. They have the start/finish by the bathrooms and near the lake. They have the perfect place to set up and it's been the same every year that I've run the race in the past. Why change something that works? I stayed in my car mostly before the race but did come out and talk to a few people I knew before each race. It was a bit chilly out but perfect temperatures for the race. I went out in the second or third wave(I think) for both races. You can see I got to start in the front for the five mile race. There were still lots of people behind me as well. All pictures are from the 5 mile race as I've already done past reviews on the half marathon and you can find them on the blog if interested under the Race Reviews tab. People behind me ready to race! The course for the five mile was really fun although a little bit taxing considering I ran a half marathon the day before. There were certainly some hills to run on this course. I showed 50+ stories of climbing and over 423 feet of elevation gain on my Garmin! Yeah, it's hilly! As you can see below, I has some quicker miles in the middle when it wasn't so hilly! The half marathon the day before also had plenty of hills to run including 1,148 feet of elevation gain. I can't remember how many stories the Garmin showed but I believe it was over 100!!! My goal for the half was just to have fun but still push myself a little. I didn't want to push too hard as my Hip Flexor had been giving me issues. Fortunately for both races, the hip was fine. The five mile course starts off going into the parking lot to get to the trailhead. We then head up to a large hill where as we make our way to the trails. Before we get to the trails, there's a dirt road that we run as well. This helps clear out the trails somewhat but it was still fairly busy for the first few miles. I never ran alone the entire time. Then the trails hit us. As you can see below, it was very hilly to start off but people were plugging along and still running up the hill. It was nice coming to some flat parts where you could try and make up some time. If you have never been on the Poto trails, you need to get out there. They have some awesome trails there for sure! There were many spots where you had some rollers too and made you continue to push to keep the same effort. Below is just before where the largest hill is on the course and it's a doozy too! Most people walked it up. The course certainly didn't disappoint. It made me wish that I lived much closer to these trails so I could run them daily. We also ran on a few wooden bridges. The one below is just before the finish. I love running over bridges! Given it was only 5 miles, before we knew it, the race was over! Frankly, I was happy to not be running a marathon or 50k (as these were option too today). The race had one aid station that was more than enough (for me anyway) for this distance. The volunteers were ready for us! The finish area is well organized, and not a surprise, given the number of years this races has been going as the park is a great place to set up for a race. The race had pretzels, bananas, cookies and oranges. Everything was under cover in case it rained. For your race entry, you received a timed race with bibs and a measured course. Since I did the No Wimps Jr race, I received a bib for each race. 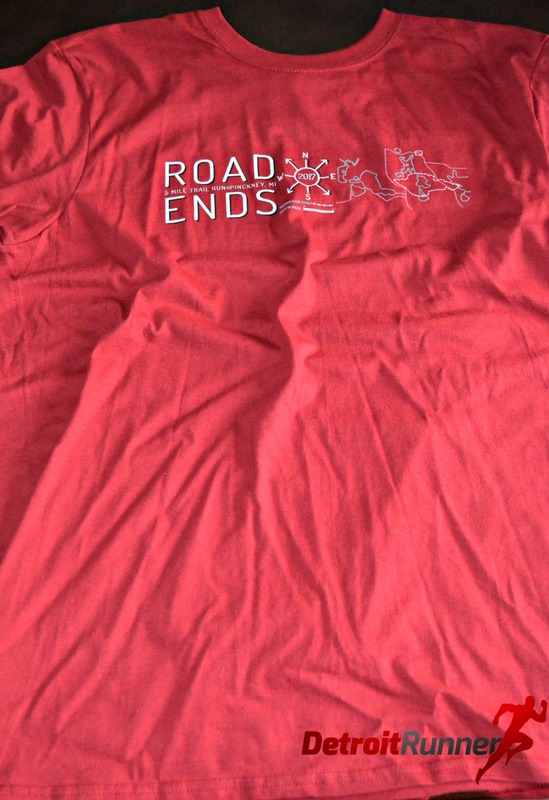 You also received a cotton shirt for the 5 mile and a tech shirt for the half marathon. I actually like getting cotton since I've got so many tech shirts. 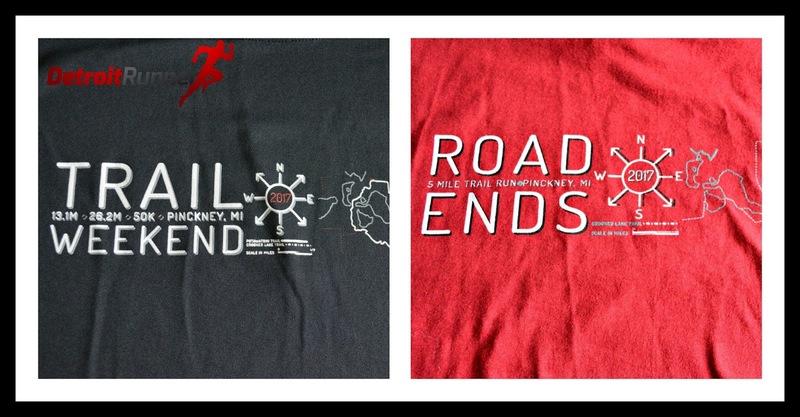 The tech shirts are a different brand so we will see how i like it. It's much better than the A4 tech shirts the race used to get that feel like garbage bags so anything is a good improvement. You get a medal for each race that you ran. 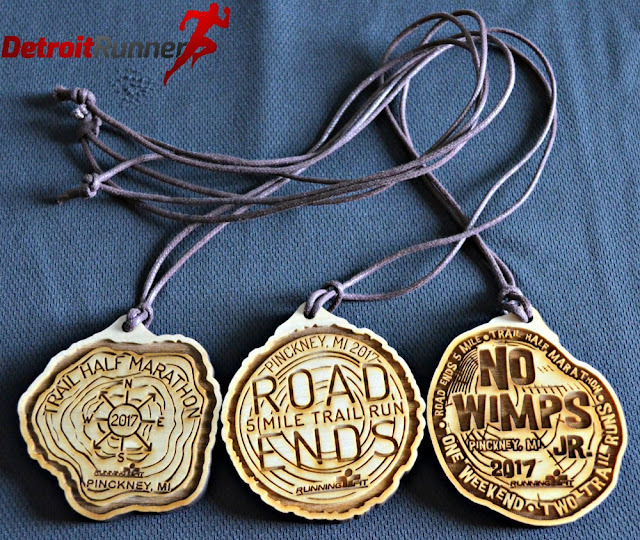 If you ran the no wimps, you also received an extra medal for three medals total. Running Fit does an awesome job at their races. 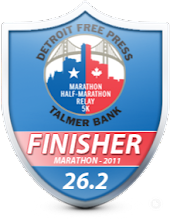 The course was well marked, the start/finish area was organized, the website had clear information. I got my bibs from transfers from two runners at the last minute and the races communicated well to get the transfer completed. Overall, it was a fun race. Im not sure I'd run the No Wimps Jr challenge again but it was fun to do. I'm probably not ready for the Full No Wimps either. I will, however, be back for the half again as it's a great course and a fun race to get your season started. 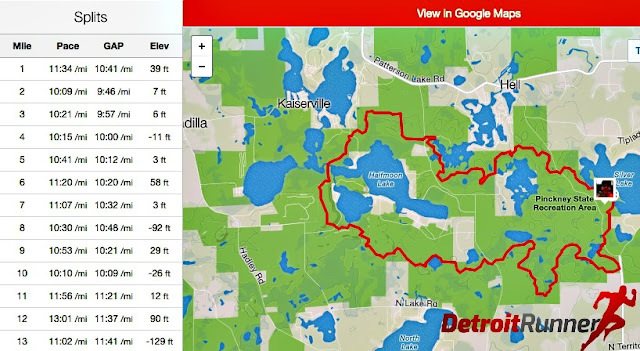 If you are looking to get into trail running, the 5 mile is a great course to get your feet wet and see what its like to run single track and hills. 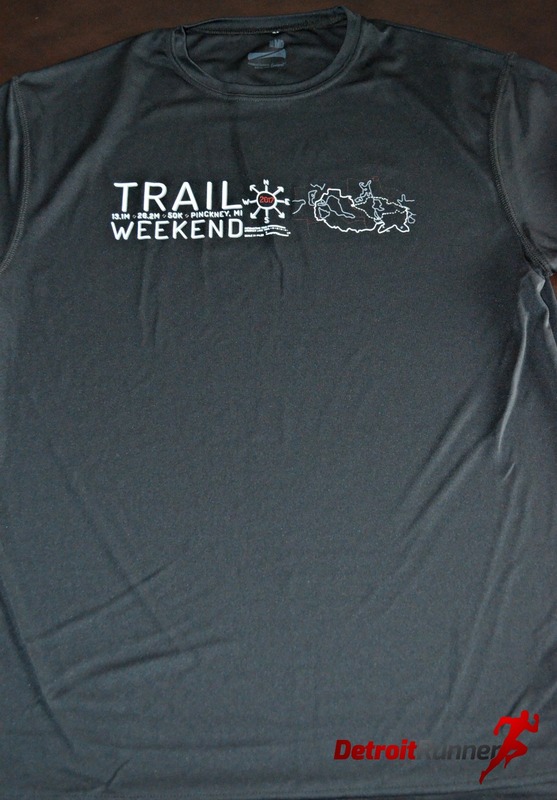 I highly recommend any of the race options for the Trail Weekend! Disclosure: I paid for my own entries and all opinions are my own. It looks like you had a great weekend of racing. I always love the pictures to see how pretty the trails are. Love that one bridge. Not so sure about those hills though, haha. Very cool medals too. Maybe one of these days I'll have to venture there. Considering my lack of trail running, the 5-mile would probably be a good distance.